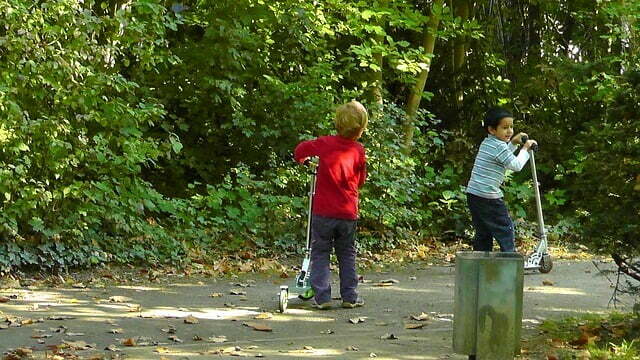 Scooters are the most enticing and favorite outdoor playing toy for kids. They always love to play with scooters. 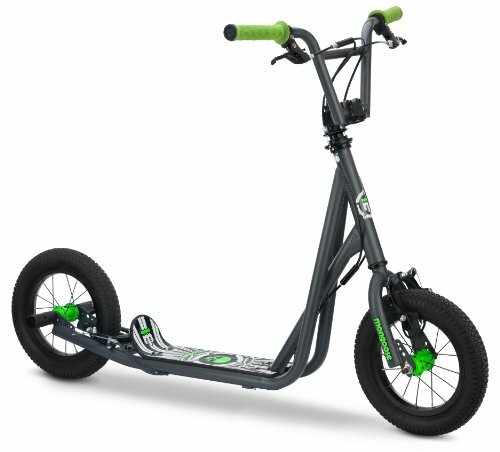 But it is really difficult to get the right one for your child as there are many options and most importantly you need to get them the scooter that is perfect for their age, height and preference. Please don’t be. Because a little bit of research will help you a lot to know about kids scooter and every other detail about it. In fact, in this buying guide, I’ve presented some most important tips about it with a list of best scooters of the market. Colors: Caribbean blue, black, black-grey, blue, green, petrol green, pink, shocking pink, purple, red, volcano grey and yellow. If you are one of those parents who never hesitate to break the bank for their children’s amusement, then probably this scooter is meant just for you. 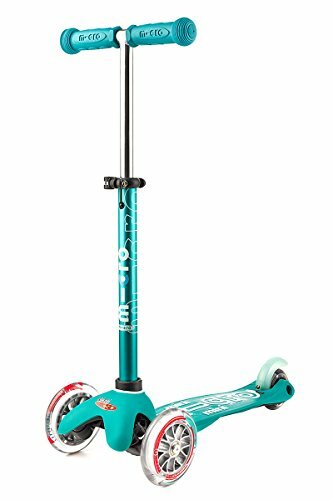 This one is the most expensive kick scooter for toddlers to young teenagers in our list. But the quality, safety measures and tiny details of craftsmanship are worth it all. First of all, it arrives pre-assembled. Just make sure you tighten the clamp on the handlebar and its ready to go! It won't fold, but you can detach the handlebar for storing this scooter in a car or a closet. The most costly and high-quality elements have been used to make this; for example, to make the deck anti-slip and durable, fiberglass is used. So that, your kids have minimal chance to slip off and will always be safe on the wheels. The wheels are made from the best quality PU materials. As a result, the rough surface of the sidewalk will never bother your kids. For parents, who can’t compromise their child’s safety at any cost, this scooter can be trusted with eyes closed. As its safety is proved by CPSC. about the price, it may seem way too much for a kids toy, but considering the materials used, it is reasonable. Colors: blue, black, green and red. The most used kick scooter among all ages is produced by this brand. They are the leading one who is making durable scooters available in affordable range. This A3 scooter is advertised as a scooter for toddlers, but I recommend not to give it to children below 6 years. Because the rear fender brake system is not convenient for young toddlers and preschoolers. Aircraft grade aluminum is the main material of this scooter. The wheels are made of Urethane to make the ride as smooth as possible. Parents claimed their A3 razor scooters last more than 5 years even after aggressive use by their children. Maybe this is the main reason behind the high sale of Razor scooters. However, if longevity is your thing, then don’t hesitate to invest in it. It is guaranteed that, like the scooter, your children’s joy will last for years too. The brake may not be suitable for kids. Colors: teal, sky blue, navy blue, black and pink. First of all, it is not just a beginner’s toy; it is for kids who have professional stuntman in them. 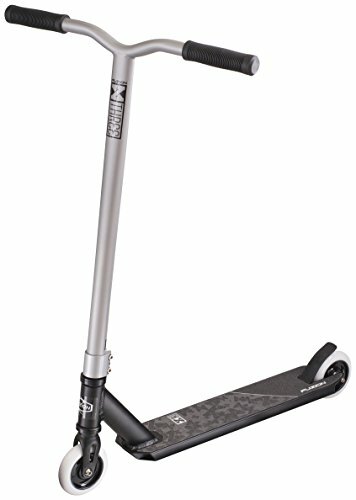 This scooter is made in a manner that they can adapt their skill as well as can master it to a professional grade. Its durable frame and wheels are made to withstand rough riding for tough kids. Its wheels are larger (118 mm) than other kids scooters and the deck is also a little bigger compared to other models from Fuizon. The design is sleek and elegant, more like an adult scooter so that your kids feel professional and rides professionally. The only bothering thing is its price. It is even pricier than most of the adult scooters that are used on daily basis. But the smooth and quite riding and easy steering and safe brake of this scooter altogether make totally worth it. As this scooter is backed by warranty and money back guarantee, hence there is less risk to invest in it despite the high price. Colors: blue/grey, dark blue, purple-grey, green, green/grey, light blue, light blue/grey, pink, pink/grey, red and red/grey. As the very first kick scooter for the toddlers, parents usually opt for scooters that has impressive safety features. This scooter from Gobler comes with all those safety measures possible to keep your kids safe while learning or riding outdoor. With the ‘steer-lock’ button you can lock down the steering feature as your child learn to balance and ride straight on it. When you are confident about their abilities, you can let them explore how to steer and brake the scooter properly. The second most useful feature is its adjustable (26.5’’ to 36.5’’) and removable T bar. You can not only adjust the bar according to their growing height but also carry it in camping, vacation or visit to the relatives. From 11 impressive color range, you can surely pick the favorite one of your child. The quality is quite impressive as well. About the price, it seemed reasonable considering the safety mechanism. The price is low compared to leading brands who don’t incorporate as much safety features as Gobler scooters. Colors: apricot, aqua, black, blue, ice blue, lavender, green, orange, ocean blue, pink, purple, red and yellow. There is no other sport as efficient as kick scooting to teach the children about balance and coordination in life and sports. Keeping that in mind, the new Deluxe series of Micro Mini scooters are designed. They have the longest color range so far among the scooters we have reviewed. It also has a T bar that can be adjusted from 17" up to 25". The weight and maximum height are lower than other scooters for toddlers, hence you can’t expect this to be useful after your kids hit 6 years of age. Besides, it needs a little assembly, which is very easy. I recommend assembling this scooter keeping your children by your side to make this a fun task. For these reasons, the price for this scooter feels a bit higher than it should be. However, the users have claimed to be satisfied with its quality, hence, you will be too. Before going to the details, I would like to inform you about its suitability. It is a cheap and cheaply made scooter. Despite that fact, we choose to place it on our list because of its convenience of use and carry. If you want your kid to practice scooting before investing in a more trustworthy one, then it is a budget buy for you. If you are lucky, this one can cover for a couple of years! Many child’s scooters have the removable facility, but this one has foldable T bar so that you can carry it wherever the kids go. The T bar can be adjusted from 14.5 inches to 24 inches, which should be suitable for children under 4.5 years old. Learning to control and balance on this scooter is very easy, even for a slow learner kid. Its rear brake is easily accessible and so is the adjustment. The problem with this scooter is, it may start collapsing after a few months of use. 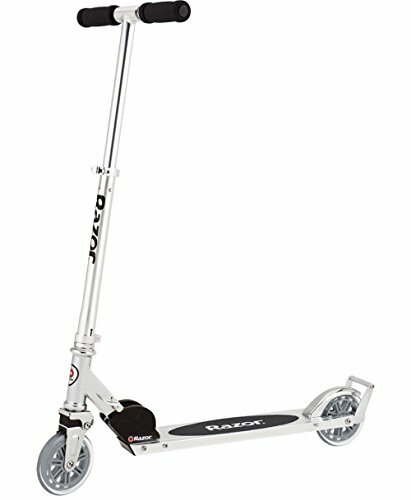 If you really consider this scooter as the first ride for your kid, be prepared to purchase a more durable and luxury one later, when the kid becomes a pro on scooting. 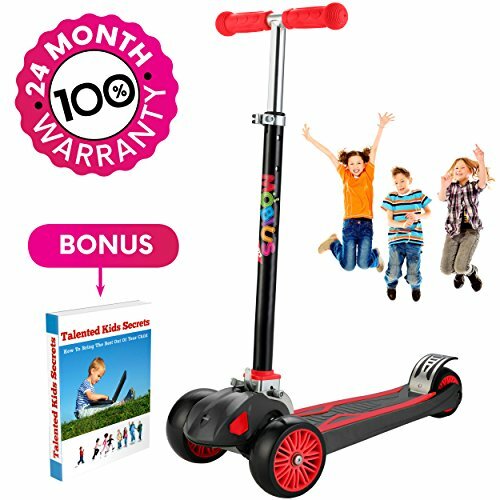 Looking for a promising kick scooter for your kids to ensure an enjoyable childhood for years? Mobius scooter is so confident about their service, that they offer a warranty for years! Short term money back guarantee is also offered, in case it’s just not your thing. 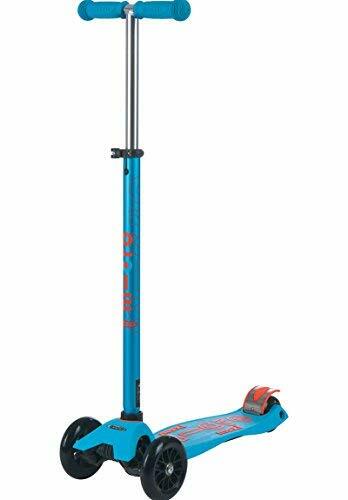 The adjustable of the T bar extend its height from 27.56’’ to 33.86’’ so that your kids can use this scooter till their early teens. To make the brake system even more efficient, ABS brake is incorporated instead of rear fender brake. With this, every turn and brake will be more confident and efficient. Apart from other impressive features regarding the quality of this scooter, I would like to mention how nicely it is packed. The packaging comes with a handle on to, which seemed convenient especially when you decide to give it to your close ones as a present. The brake is more efficient. In-a-ward, it is a kick scooter for kids which has two bike-like large air filled wheels. To minimize getting stuck in the broken sidewalks or in the sand, there is nothing so efficient as bike-wheels. Besides, the brake is used is also a bike styled brake that is placed in the handlebars. So that, there is no need to use a rear fender break or any other brake. Steering, stopping and riding on this bike will surely give an experience that your kids won't be able to have from any other scooters. It is adjustable, but can’t be folded. But with the kickstand and lock, your kid can park it simply on the bike park zone. Currently, this scooter is backed by 5 years warranty, which is more than enough for a growing child. They may outgrow even before the warranty is over. The only thing that may bother you is, it comes unassembled and you will need a range of tools like Allen wrench, adjustable wrench or 9, 10, 14 & 15 mm box end wrenches or sockets, Cable cutters or scissors etc. but the assembly is quite easy. Once you assemble it, the scooter will keep you stress-free for years. The advertisement says, this scooter is for 2+ children, but I recommend this for even younger ones. Because, their identical, turning without compromising mobility mechanism makes the scooter a bit slow. Hence, it fits for young toddlers rather than preschoolers. The wide base is really good for developing a sense of stability among the kids. There are only two colors are available in different shades of this model. Check before ordering whether there is a foot brake or not because all these do not come with foot brakes. The price makes this scooter available for parents on a tight budget. 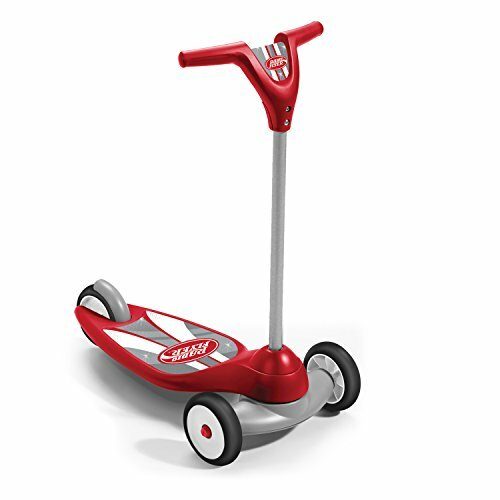 As a decent scooter for young learners, this scooter from Radio Flyer will not disappoint you. Colors: black, white, blue and green, orange and blue, neon yellow, lime, teal, and red. This scooter is meant for practicing tricks in the skatepark. The frame, deck, and wheels are made of tough materials to resist rough riding and deliver fast spinning. The attached wheel is of 100mm size, but the faze fork can take wheels up to 110mm size for smoother rides on the sidewalk. The brake is ABS style and made with steel and nylon to make it long lasting and silent. Users claimed about the handler bars are wider and the deck is larger than other brands, making it convenient for tricksters. 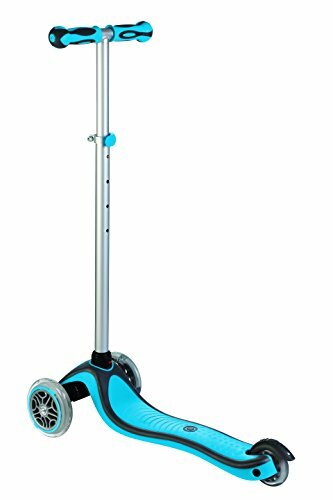 With the durability of a professional-grade kick scooter, this scooter is offered at a very low price. All the parts, bolts and bearings are highly durable and need very little effort for assembly. Only the tape of the handlebar may peel off over time. Other than that, this scooter is a perfect one for sport loving teens. But nowadays, modern scooters run with engineered machines so that your kids can have more fun with healthy physical activity. As the design has been changed, you’ll find mainly six types of kids scooter now available in the market. You can choose any of them according to your kid's age and choice. 3 Wheels scooters are the perfect first scooter for your kids. They are stable and have less possibility of an accident. Most of the three wheels have a single wheel in back and double in front to have better balance. This type of scooters is extremely popular among parents and kids to ride for the first time. 2 wheels scooter are for older kids who have a sense of balance. Two wheelers have higher speed and can take more weight. They are made with durable materials. Generally, 2 wheel scooters are perfect for kids of 5 to 8 years old. These are specialized 2 wheel scooters built with high quality and designed for trick riding or stunts. The specialty of this scooter is “T-bar” handlebars which gives the rider the greater stability and allow them to perform different tricks & flips. 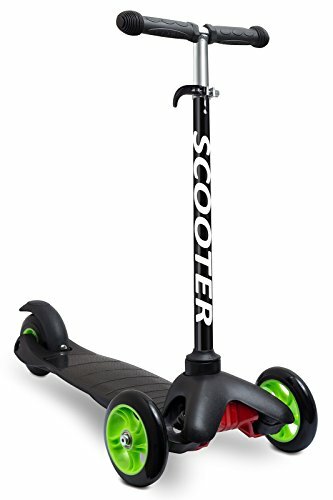 If your kid is really ‘into’ scooting, this the scooter he/ she will love to have. Electric scooters are powered with an electric motor and rechargeable battery. They are a little bit heavy and come with chunky wheels. They are more stable and can be used for commuting to a long distance. And as they run on batteries, kids don’t need extra physical involvement to ride it. These scooters come with large wheels and tires which allows your kids to drive it on rough roads. Wheels of these scooters made with the best quality material and the frame material is also designed to take more weight so older kids can ride them easily. These scooters have three wheels, one at the front and two at the back. Caster scooters have wide foot space as the back wheels are spaced far apart. This wide foot space makes it spacious and allow the kids a smoother ride. While choosing a scooter for your kid, firstly you need to consider 2 most important things about the rider. Three-wheeled scooters are the best choice for toddlers and very younger children. This type of scooters will help them to learn and develop balance and confidence. Kids of 4- 12 year age have a wide range of options to choose from. They can choose any available type according to their preferences. Kids of this age have learned well about balance and also set their preferences, so they can go for pro, electric or off-road scooters. If your kid is using his/ her scooter for regular use 2 wheeled scooter are great, they are also affordable. If you want better quality, you can also go for electric, off- road or caster scooter. For the pro rider who wants to perform stunts the only choice is Pro Scooter. Because only this type of scooters is designed to absorb jumps, tricks and stunts. Others will break down on their first attempt of stunt. You’ll find scooters with or without brakes. But it is always better to get your kids a scooter with brakes. This will help them to have control over the device and avoid an accident. In modern days many scooters are designed to fold while not using. This feature will help you and your kid to store and carry easily while they are not using this or they don’t find any parking spot for scooters. Most of the scooters has T-bar handlebar to steer. But it would be better if you get your kid a additional type of handlebar. It’ll help your child to steer the scooter in more comfortable way. As a parent you must be concern about the weight level of the scooter. So before buying, check that it can carry the weight of your child & skill level. The next important thing you should check is the wheel size. Because wheels with right size will help your kids to balance the scooter. So the wheel must be in right size and of course it need to be strong. You also need to check the material the scooter is made with. Because the weight of the scooter mostly depends on its material. 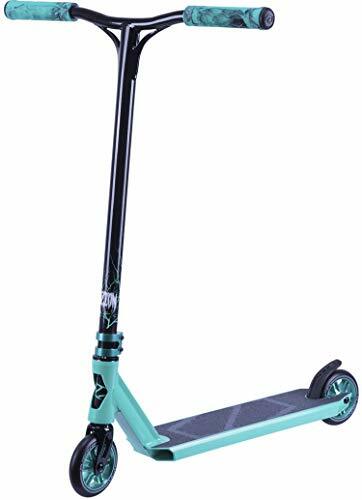 Generally, scooters made with aluminum deck & polyurethane wheels are lightweight and it is also easy to ride for younger kids. A scooter that last for a long time is more preferable. As kids kids grow up fast, it would be better if you get them a scooter with adjustable handlebar and made with strong, rust- free, non- breakable material. Most of all the scooter must be easy to operate for your child. Like, handlebar should be comfortable for them to steer, the weight of the scooter need to be less to carry. 1. Get them the proper safety gear for knee, elbow, head and hands. 2. Buy the scooter that is perfect for your child’s age and size. 3. It would be great if you give your kids proper training before let them ride on their own. 4. Like other outdoor activities, you should always pay attention while your child is riding the scooter. 5. It would be better if your kid scoot with other kids. Scooters are really great toy for kids, it helps them to be more sociable & outgoing. But before giving your kid a scooter you need to be careful about their safety and choose the right one for them. But as children are precious to every parent it can be difficult to choose one from a lot of available variety. That’s why I’ve tried to share some tips about choosing the best scooter for your loving child. Hope you’ve got proper idea about choosing the right scooter for your child. But no matter which one you choose, just remember to check that the scooter you’ve selected is proper for your child’s age and size.